Two days after he lost out on a Rajya Sabha nomination on Samajwadi Party (SP) ticket to actor Jaya Bachchan, now-retiring MP from the Upper House, Samajwadi Party leader Naresh Agarwal, joined the BJP but not before he sparked controversy with his comments on Ms. Bachchan. Flanked by Union Minister for Railways Piyush Goyal and with BJP spokesperson Sambit Patra in tow, Mr. Agarwal made no secret of his disappointment at being edged out by Ms. Bachchan. “I am joining the party as I feel that to serve the country one needs to be part of a national party. I will always carry deep respect in my heart for [SP chief] Mulayam Singh Yadav and [MP] Ram Gopal Yadav, but the way things are going in the SP, has prompted me to leave. The party, through its ill-advised coalitions has reduced itself to a small regional party, and then to ignore my claims and equate me with someone who dances and sings in films [Jaya Bachchan] was not acceptable to me,” Mr. Agarwal said. The BJP quickly distanced itself from his comment. “The BJP respects political workers from all walks of life,” said party spokesperson Sambit Patra. Minister for External Affairs Sushma Swaraj took to Twitter to register her unhappiness with Mr. Agarwal’s remark, terming it improper and unacceptable. “Naresh Agarwal has joined the Bharatiya Janata Party (BJP). He is welcome. However, his comments regarding Jaya Bachchan are improper and unacceptable,” she tweeted. Later, Mr. Agarwal’s aides were at pains to explain that he was as aggrieved at the dismissal of Mr. Ram Gopal Yadav’s claims in favour of Ms. Bachchan as he was for his own. “So his words may have come out wrong,” said an aide. Mr Agarwal further said that his “community” (Baniya-Vaish) had “anyway” been big supporters of the BJP and would therefore be happy to see him in the BJP. Mr. Agarwal’s son Nitin Agarwal, a three-time MLA in U.P., too joined the BJP. The BJP has fielded a ninth candidate for the 10 Rajya Sabha seats going to polls in Uttar Pradesh out of which the party is comfortably placed to win eight, in order to needle the new SP-Bahujan Samaj Party (BSP) unity candidate for the 10th seat. He further said that as on July 27, 1,566 PANs have been identified as ‘fake’ which were allotted to either non-existent person or in the names of persons with false identities. “Information of various kinds of wrong-doings by about 400 persons was also shared with other law enforcement agencies such as Enforcement Directorate and Central Bureau of Investigation for appropriate action,” he said. Referring to the launch of ‘Operation Clean Money’ on January 31, Gangwar said about 18 lakh persons whose cash transactions did not appear in line with their tax profile were identified and approached through email/SMS. “Advance data analytics tools were deployed which further identified 5.56 lakhs new cases and about 1 lakh those cases in which either partial or no response was received in the earlier phase. Besides, about 200 high risk clusters of persons were identified for appropriate action,” the minister added. Chief Minister Arvind Kejriwal has been summoned as an accused in a criminal defamation complaint filed by Rajya Sabha MP Subhash Chandra by a Delhi court which said “prima facie”, the offence was committed. Noting that the imputations were prima facie made against Chandra’s reputation, Metropolitan Magistrate Snigdha Sarvaria asked Kejriwal to appear before the court on July 29.
such imputations intending to harm the reputation of the complainant or to defame him, were made, the court said. “Thus, clearly, there is sufficient material on record to summon accused Arvind Kejriwal for offences punishable under section 500 (defamation) of the Indian Penal Code,” it said. Chandra had on November 17 last year moved the court seeking prosecution of Kejriwal for allegedly defaming him by levelling false allegations in the wake of demonetisation. Chandra, who filed the plea through lawyer Vijay Aggarwal, alleged that Kejriwal, while addressing a press conference on November 11, had made “false, fabricated and defamatory allegations” against him. Rajya Sabha witnessed a major chaos on Wednesday when Prime Minister Narendra Modi said that only his predecessor Manmohan Singh could teach the art of taking bath with the raincoat on. 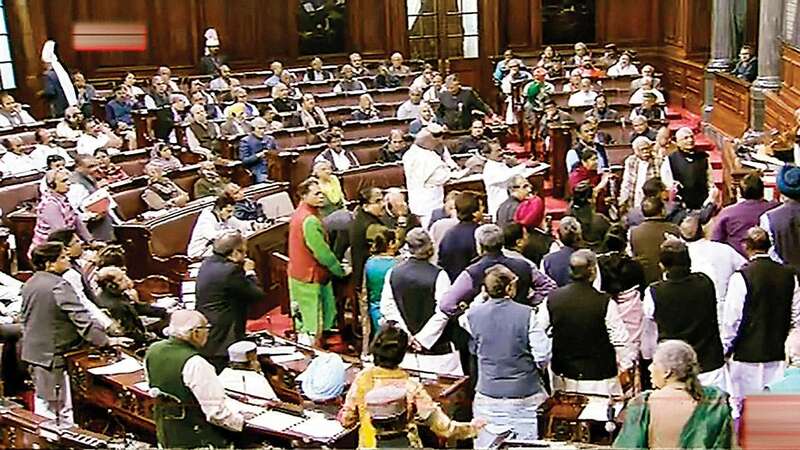 The Congress reacted sharply to the comment and staged a walk out from the House. PM Modi made the comment while responding to the debate on on the Motion of Thanks on the President’s Address. Behavioural changes are needed for cashless economy. These changes take time: PM Modi. Jyoti Basu in 4th Sept, 1972 said in LS that Indira Gandhi government is based on black money, for the black money and to the black money: PM. I expected SitaramYechury to support us on note ban, but I was wrong: PM in Rajya Sabha. PM Modi attacks Congress for walkout, says if they breach decorum, they should have courage to listen to the response too. There was so much said about what is wrong with the nation, perhaps they were giving a report card of their own record: PM. People who are opposing note ban will one day understand its benefits, says PM. Congress MPs stage a walkout in Rajya Sabha over PM Modi’s remark on former PM Manmohan Singh. In the last 30-35 years, Dr Manmohan Singh has had a direct contribution to India’s economy. : PM Modi. Ek bhi daagh nahi laga un par? Bathroom mein raincoat pehen kar nahaane ki kala sirf Dr saab(MMS) hi jaante hain, adds PM Modi. (No one knows the art of bathing inside bathroom wearing a raincoat better than Dr Manmohan Singh). Why is this running commentary going on?, asks Venkaiah Naidu to Opposition during PM speech in RS. You quote foreign economists, I can quote 10 of them on the fact that such an action hasn’t been taken in the world ever. Worlds’ economists don’t know parameters to assess it. What India did will be a case study for economists worldwide: PM. For the first time, a horizontal divide was visible. Mood of the people completely different from mood of politicians: PM. Government and people of this country were together on the issue of note ban, adds PM. There is no parallel of this massive decision (of demonetisation) in this world. This can be a huge case-study for the world: PM. There’s a direct link between terror funding and black money, says PM. But we should not forget that there have been attempts to loot banks after note ban: PM. About 700 Maoists surrendered after demonetisation and this number is increasing. Shouldn’t this make us happy: PM. PM Modi rakes up Wanchu Committee report on corruption. Former bureaucrat Madhav Godbole in a book wrote that in 1971 Indira Gandhi ji was advised by then FM to demonetise, but she rejected idea: PM. You (Anand Sharma) are showing so much zeal, why were you quiet till now? Why did you not sue Madhav Godbole?, asks PM Modi in RS. There’ve been efforts before too. But there’s always scope for improvement. After all, how long we’ll hide our problems under carpet: PM. We will have to be tough on those who are cheating the system. When we do that, the hands of the poor will be strengthened: PM. Corruption has adversely impacted the aspirations of the poor and the middle class, says PM Modi. The fight against corruption and black money is not a political fight. It is not to single out any particular party: PM. Several members have shared their views and there was considerable discussion on demonetisation: PM. The Rajya Sabha passed the Goods and Services Tax (GST) Constitutional Amendment Bill which the Lok Sabha had already approved last year. The exact rate of the tax will only be decided in the weeks or months ahead. “The GST bill will empower the states, will increase revenue of states as well as Centre. It’ll ensure that there is ‘no tax on tax’ “finance minister Arun Jaitley said on Wednesday in the Lok Sabha. It was the Congress-led UPA government that was the first one to table an iteration of the bill, which it did on 2011. It couldn’t pass the bill then due to opposition disagreement. Then the BJP-led NDA tabled another version of the bill in 2014. That couldn’t pass because this time, it faced disagreement on some of the provisions of the bill from its opposition, mainly the Congress party. While the Congress party on Wednesday support the GST Constitutional Amendment Bill, it made it perfectly clear it will only approve a later GST ‘rate’ bill if that’s decided by both Houses of Parliament, and not just the Lok Sabha. As well, the standard rate of GST should not exceed 18%, the Congress said today in the Rajya Sabha. Earlier today, Jaitley thanked the Congress. “There has been major consensus building that has taken place. I am extremely thankful to all opposition parties especially Ghulam Nabi Azad (of the Congress,” Jaitley said. The Congres said it was grateful that the BJP acknowledged it was the Congress that first announced the GST. “I’m glad FM acknowledged that it was UPA govt that first officially announced the intention to bring GST,” the former finance minister P Chidambaram of the Congress said in the Rajya Sabha.”Hope the finance minister will pass GST bill not on strength of numbers but in strength of his arguments,” he added.